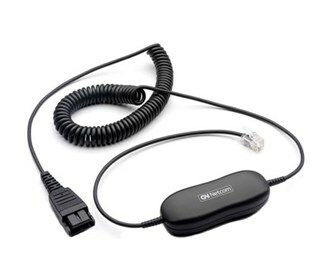 The Jabra QD Siemens OS Coiled 8800-01-94 is adapter for Siemens OpenStage phone. It has 1 x RJ-45 male phone connector on first end and 1 x quick disconnect audio on second end. The Jabra QD Siemens OS Coiled 8800-01-94 has many exciting features for users of all types. You can extend the lifetime of your Jabra QD Siemens OS Coiled 8800-01-94 with the purchase of a FactoryOutletStore Factory Protection Plan. The Jabra QD Siemens OS Coiled 8800-01-94 is sold as a Brand New Unopened Item.